Mr. Craig Becker speaks at the McWhorter Society Luncheon at Belmont University in Nashville, Tennessee, May 3, 2018. The Tennessee Health Care Hall of Fame announced the seven health care professionals selected as this year’s inductee class at a luncheon on Belmont University’s campus today. With a mission to honor men and women who have made significant and lasting contributions to the health and health care industries, the Hall of Fame was created in 2015 by Belmont University, the McWhorter Society and the Nashville Health Care Council, a founding partner. The seven honorees will be inducted at a ceremony in October. serves as an outstanding role model in their community. Among the nearly 40 highly qualified nominees, inductees were chosen by a Selection Committee made up of health and health care leaders from across the state. Selected inductees represent some of Tennessee’s greatest health and health care pioneers, leaders and innovators. Since its creation, the Hall of Fame has previously inducted 20 members including Jack Bovender, Dr. Dorothy Lavinia Brown, Dr. Stanley Cohen, Dr. Colleen Conway-Welch, Dr. Thomas Frist, Jr., Dr. Thomas Frist, Sr., Dr. William H. Frist, Dr. Henry Foster, Dr. Ernest Goodpasture, Joel Gordon, Dr. Frank Groner, Dr. Harry Jacobson, Jack C. Massey, R. Clayton McWhorter, Dr. Stanford Moore, Dr. Donald Pinkel, Dr. David Satcher, Dr. Mildred Stahlman, Dr. Paul Stanton and Danny Thomas. 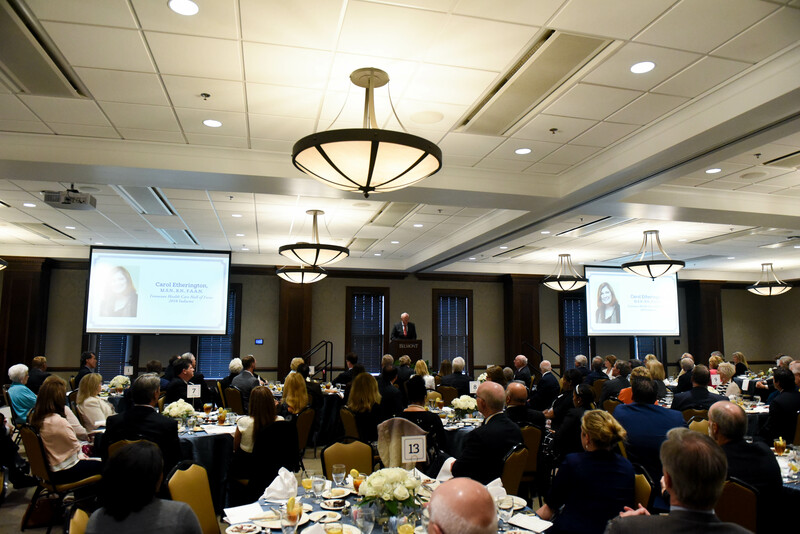 In addition to announcing this year’s inductees, the luncheon today also honored Governor Winfield Dunn with the 2018 McWhorter Society Distinguished Service Award, a recognition established to honor individuals who have made significant contributions to the health and health care related academic programs at Belmont University and whose life work serves as a powerful example for students.